"The Vanishing Lady" is an old urban legend about an international conspiracy at a World's Fair. It is also known as "The Vanishing Hotel Room." 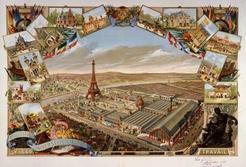 The setting is the 1889 Exposition Universelle in Paris. In this urban legend, an Englishwoman and her daughter stop in Paris on their way from India to England. The mother becomes ill shortly after they arrive and the hotel doctor sends the daughter out for medicine. When she returns, her mother has vanished! Escape dramatized this Victorian horror legend with only a few changes. Their version is taken from the story published by author/critic Alexander Woollcott in his book While Rome Burns in 1934. Woollcott was himself a bit of a horror legend for dying onstage during a radio show, but he is best remembered as the inspiration for the character of Sheridan Whiteside from the play and movie The Man Who Came to Dinner (1942). In the urban legend the daughter goes insane as a result of the conspiracy and ends up in a British mental hospital, but Escape's version has an odd ending that leaves you wondering what happens next. "The Vanishing Lady" was also done for an episode of the television show Alfred Hitchcock Presents under the title "Into Thin Air". It has also appeared in novels and movies. This episode stars Joan Banks and Hy Averback in the lead roles. It was broadcast on February 1, 1948, and repeated on January 10, 1950. Suspense only presented the original legend of "The Vanishing Lady" once. They recycled the same radio-play that Escape had used in 1948 but shortened it considerably. Instead of playing the story out, the announcer talks us through the history of the legend. Alexander Woollcott's thoughts on the subject are also discussed. The radio-play was based on Woolcott's 1934 short story and adapted for Suspense by William N. Robson. On the whole, Escape's was the better presentation. Suspense's "The Vanishing Lady" starred Edgar Barrier, Diana Bourbon, Vanessa Brown and John Dehner. it aired on April 7, 1957. Very good write-up for this episode. I was a little shocked to learn that the story never happened! All this time I had thought it was a weird-but-true historical event. I was also surprised to learn that the source was Alexander Woolcott's collection of articles, "While Rome Burns". I have that book, well a 1942 reprint edition of the '34 original, and I cannot find any reference to any Vanishing Lady stories in this collection. Was the story dropped from later editions? I wonder if it's an urban legend in itself that Woolcott wrote an article about this Parisian urban legend..! Love your site, very glad I found it. Very cool! I just listened to this episode, totally enthralled! Thank goodnes for the internet age where I could look it up quickly. This story really gave me chills!